Divine words of Swami to Brahmacharis, young children and students on this powerful Mantra. Today is Sankara jayanthi - the day commemorating the advent of Sri Sankaracharya who came to restore Dharma; it is also the day on which Brahmopadesam was given here for the boys sitting on the dais who have come from Bengal, Bombay, Hyderabad and Bangalore. The Sankara jayanthi was chosen by me for the initiation into higher Adhyathmic life, for Sankara was inspiration even today for millions of sadhakas all over the world who seek to know the reality of the universe and its fundamental Unity. They had the lucky chances of getting initiated here in My presence by Me as a result of their own good fortune. The ceremony of Brahmopadesam is called Upanayanam because the word means, “Taking near” taking the young aspirant near Brahmam that is to say introducing to him Brahmajignasa, the path of Brahma. It is one of the samskaras, that is rites which reconstruct the personality, reform the mind, purify it and rebuild it. It makes the person receiving it, a “Dwija”, a twice born! The boy is first born into this world, now he is born into the sadhaka world. He becomes Brahmachari, a person who walks towards Brahman. So, it is a very significant day in the lives of these people a day that they must long remember with joy and thankfulness. It is the day when their hearts were turned towards God; and they should try not to run away from God from henceafter; That is a great responsibility. The initiation was done by the Upadesam of Gayathri Manthram. This Manthram is a universal prayer that can be used by means of all castes and creeds for it calls upon the glorious power that pervades the Sun and the three worlds to arouse, awaken and strengthen the intelligence, so that it may lead to intense sadhana and sadhana may lead to success. Every little movement or incident results in sound; only you may not be able to hear, because the range of your ear is limited. The falling of the eyelid over the eye makes a sound; the dropping of dew on petal makes a sound. Any little agitation disturbing the calm circumstance is bound to produce sound. The sound caused by the primal movement that resulted in enveloping of Brahmam by the self-evolved Maya is the Pranava sabdha or OM. The Gayathri is the elaboration of Pranava and so, it is now held so venerable and valuable that initiation to Adhyathmic life is achieved by its contemplation. The sound of a Manthra is as valuable as its meaning. Even a poisonous cobra is quietened by music. Naadam or sound has that allaying property. The child in a cradle stops wailing as soon as the lullaby is sung; it may not carry any meaning. It may be a nonsensical rhyme or just a jingle. But it quietens, soothens the nerves and induces sleep. In the case of Gayathri the meaning too is easy and profound. It does not ask for mercy or pardon; it asks for a clear intellect, so that the truth may be reflected therein, correctly, without any disfigurement. The Brahmachari has vowed himself into a life of sadhana. Now what are the requisites of Sadhana? First, Faith- that can stand the ridicule of the ignorant, the caviling by the worldly and the laughter of the low minded. When someone ridicules, you argue like this within yourself: Is he ridiculing my body? Well! He is doing what I myself would wish to do: Well I too want to escape out of this attachment to this body. Is he ridiculing the Atma? Well! He is doing the impossible; For the Atma is beyond the reach of words or thought. It is unaffected by praise or blame. Say to yourself,” My atma thathwa is Nischala; It is Nirmala.” And carry on. Second: Do not worry about ups and downs; loss or gain; joy or grief. If you but care, it will all be at one smooth level. You label something as loss and something else as gain. You crave for a thing and when you get it, you call it joy; when you don’t, you call it grief. Cut the craving off, and there will be no more swinging from joy to grief. Reason out and get it convinced of the truth” Sarvam Brahmamayam”. You know that there are five elements or Bhuthas, which constitute by their permutations and combinations, the world called ,Prapancham, the “ Five constituted”. Prithvi or earth element has five qualities, the maximum and so it is the grossest. It has its own special characteristic of Gandha as well as the characteristics of the other four. Sparsa, Rasa, Rupa and Sabda. The next one Jala, the water element has only four, its own special one Rasa; besides Sparsa Rupa and Sabda. So it is subtler than the Earth element. Agni is subtler still, because apart from its special characteristic of Rupa, it has only two others; Sabda and sparsa. Vayu, the Air element has sparsa as its special quality and one more quality Sabda. Finally, the lightest and subtlest of all the five, Akasa- the Sky element has only one characteristic of its own; that is Sabda. Now God is subtler than even Akasa and so He is all pervading, even more than ether or anything more pervasive than that. His nature is beyond all human vocabulary, beyond all human mathematics. Have this conviction well established in your Buddhi. Be steady in Sadhana, and never hesitate, once you have decided on it. When the bus is moving on the dust is floating behind as a cloud. It is only when it stops with a jerk, that the dust will envelop the faces of the passengers. So, keep moving, keep steadily engaged in sadhana. Then the cloudy dust of the objective world will not cover your face. Sankaracharya came for the work of Dharmasthapana, but he did not wage a war with narrow sectarians or the wild theologians who opposed him or the critics who condemned him as a pseudo-Buddhist. He won them over by argument, persuasion and preaching. He spoke softly but with conviction. He gave his opponents fair chances to present their cases to the best of their ability and sometimes he even helped them to clarify their points of view. Through Bodha alone can Dharma be saved in the modern Kali age, That is why I too am engaged in Bodha in this task of reconstructing through Upadesa. Scatter the seeds on the surface of the soil; they will not germinate. You have to keep them inside the soil. So too, Bodha if it is scattered on the surface, it will not germinate, grow into the tree of knowledge and yield the fruit of wisdom. Plant it in the heart. Water the plant with Prema, manure it with Faith and Courage, keep off the pests with insecticides of Bhajana and sathsanga so that you will benefit in the end. You have not yet got started in Sadhana; still you demand Santhi; You demand Grace. How is it ever possible? Start then, everything will be added unto you. God gives you whatever you pray for; so, take care. Ask for the right things. There was a man who had four wives; He happened to go to Bombay for some work connected with his business. From there he wrote to all of them that he was prepared to bring home whatever each of them wanted. So, they all wrote to him giving a list of all the things they wanted. The first wife asked for some nice tonics for her health and rugs and woolen clothing, to be of service whenever she fell ill. Te second wife wanted some sarees of the latest style, cholie pieces, jewellery of Bombay type and such other sundry decorative stuff. The third asked him to select some religious books, the jnaneswari, abhangs, Bhakthavijaya, etc; available in Bombay bookshops as well as the pictures of Pandarinath, Bhavani, Sai Baba etc; The fourth wife had no list at all. She simply wrote, “If you return soon and safe, that is enough for me. She got nothing but his love. The others got huge packets containing whatever they had written for. So, think well, discriminate clearly, before you ask, before you pray. I know how you are all systematic in eating and drinking. You take pretty good care of the needs of the spirit also. Take a dose of Dhyanam and Japam as the morning breakfast; puja and Archana as lunch at noon; some sathsanga or sath chinthana or sath Grantha parayana or Namalikhitha as the afternoon tea and snacks; an hour of Bhajana as dinner and a small ten minute Manana as the cup of milk before going to bed-that dietary is enough to keep your inner being happy and healthy. That is my advice to you today. Dikshith said just now, this is a sacred day,not only for the 35 boys who were initiated into Brhamacharaya, but for Sanathana Dharma itself since the upanayanams here are an important Step in the restoration of Varnasrama Dharma itself. The study of the Vedas is the highest type of learning, since it leads to the conquest of death. All other studies deal with the means living or the surroundings within which you have to live; they deal with earning and spending deriving a little pleasure by this trick, escaping a little grief by that other trick. The Vedas show the path to the Realm of Eternal Bliss, where there is no Birth or Death. People learn all the details about China, Russia and America; they know about the volcano of the Pacific or the islands of the Arctic regions, but they do not know an iota about the features of their own inner realms. There are five such Realms in them; they are aware of only of the outermost, the annamayakosa, the material casement, in which they are housed; even this is just an awareness, not the full knowledge. There are deeper layers of which they are ignorant, the Pranamaya, the Manomaya, the Vijnanamaya and the Anandamaya. Those who are conscious only of the Annamayakosa, can claim to be kamaswarupa and not Ramaswarupa. That is to say that they will be swayed by every gust of Kama or Desire. They will scarce be able to control Desire and rise to the demands made on their nobler virtues by the Divinity latent in them. They will get proper inspiration and instructions to explore and exploit inner realms only from the Vedas and the Sastras that expound the vedic truths. The Karma kanda is the biggest part of the Vedas, because karma or sanctified acts is the means by which the tree blossoms; and the fruit matures and grows; the Upasanakanda deals with upasana the method by which it ripens. The Gnana kanda describes Gnana the process by which the fruit fills itself with sweetness. The first stage takes the longest time, so, it comprises the largest portion. The second and third are quicker by comparison. So, they are shorter portions of Vedas.The third stage, becoming sweet, can be accomplished even apart from the tree keeping in a warm place amidst straw or in a hot room. Man can acquire the sweetness of Gnana by keeping himself in sathsang or even by remaining in a solitary place, all by himself in dhyanam, for example. But by whatever means, the sweetness or Gnana cannot be injected from outside, it must grow from within. It is the transformation of the inner nature, won by inner struggle with inner foes. Just think of this for a while. You have come in this body, in this receptacle, in order to realize the God you really are. This body is the cocoon you have spun round yourselves, by means of your impulses and desires. Use it while it lasts, to grow wings so that you can escape from it. You came to this world crying, announcing your grief at being thrust into it. What caused that grief? It is the grief of having lost the hold on God. Having come with the grief, decide not to go withit from here. Get rid of it in this life. You were told now that Ramayana was welling with Soka rasa; The main tone of that epic was, it was said, agony. Well, the first step to prayer is grief, a touch of agony. Agony is more potent than awe, in leading you Godwards. Grieve for lost chances, lost time; move on every day, forward to the goal. Amidst all these absurd loves and hates,the meaningless game of having and hoarding, losing and lamenting, building and demolishing castles in the air, you have no moment of real calm. Peace of mind won’t descend on you because your room is air-conditioned or your sofa is soft cushioned. it does not depend on your bank balance or, on the number of diplomas you have collected. Manifest Himself, It can come only when you deny the Danava in you all chances of moving you, when you encourage the Divine in you. The Danava is the prompter of asuric traits mentioned in the Geetha as explained by SubramanayaDikshith now. Everthing in the universe is Divine; It Is, it shines, it is lovable. It is Asthi, Bhaathi and Priyam. It is SathChithAnandam. For, it is the same as the Universal Eternal Absolute, which is also Sath - Chith - Anandam. This is the Upadesam these boys got today, through the manthram that was taught to them. Upa-Nayanam means “Near leading” leading near, leading the boy to the teacher; taking him to the teacher, the guru, for this Upadesam, this initiation. The guru, to give this Upadesam must himself have transgressed the realm of nature and form, the relative regions of worldly ambitions and achievements and he must have experienced the oneness of all this variety. Such men do not put up boards to announce their greatness or compete with other claimants for status or rewards. These boys are specially lucky; good fortune, of which even they are not aware, has brought them here for this ceremony, which will transform them. They have consciously, in previous births, meritorious deeds, the future of which they are now tasting unawares. The Guru does not teach anything new; He reveals you to yourself, He trains you to cleanse the mirror of your heart, so that you may be reflected in it without any warp or twist, The Brahmachari or Disciple must obey the commands of the guru without flinching and to the full. While Anjaneya was bringing the sanjeevini mountain, he had to take a course that made the citizens of Nadigrama see him in the sky. Baratha who saw the strange sight of a monkey carrying a hill,brought him down and when he leant that the hill had a drug that could cure Rama, Bharatha offered to send the hill quicker to where Rama was, by shooting an arrow which will lift it and carry it fast. But Anjaneya said that he would fly quicker than any arrow from the bow. Use your fullest power to grasp the truth. Rely on your own skills and your own force. Then they too will develop to the utmost demand you make of them. That alone will give you the greatest joy. Many of these boys are joining the veda sastra patasala here or have already joined it. They will be enthused by each other in their studies and sadhana. When ten friends gather around you and shout, “come; come, we shall go” you feel like joining them and you gladly go on the adventure they have in mind. Teachers at the Patasala, who are experienced men, will foster the virtues you cultivate and encourage you at every step. I am planting the sapling in your heart. They will water it and manure it. I shall also water it off and on especially when they are not with you. In order that the lotus may not go dry, the lake should be full of water. Prema is the water that must fill the heart; Hatred will make it a parched waste. Have faith in your own Atma; that is the medicine. Act always in the spirit of service and kinship with all; that is the regimen. To all of you I say, “Let mountains fall; let the sea overwhelm the land; but do not give up your sadhana. And remember sadhana is a waste unless you grow at the same time in virtue and uprightness. ”If you give up all and surrender to the Lord, he will guard you and guide you. When you complain, “O He has not guarded me,” I reply, “You have not surrendered. ”The Lord has come just for this very task. He is declaring that He will do so; that is the very task that has brought Him. Of course you only talk of saranam, Surrender; of placing all at the feet; But you withhold a great deal. Your minds are wayward like monkeys that skip and jump from branch to branch. Give them to me. I can make them steady and harmless. When I say “sit” they will sit. When I say “stand“ they stand. That was what Sankaracharya offered to do; He told Siva That he would hand over the monkey that was his mind to Siva so that it might be tamed by Him and used for His delight. But it must be a complete handing over. No reservations in your favour. "Chant the Gayatri daily and It will lead you to the realisation of the splendour of Brahman by setting you free from the limitations which surround the three worlds, the three gunas, and the triple aspects of time. The Gayatri should be chanted in order to purify the mind and like the Sun's rays. It will dispel the darkness from within you. Children, right now is the Golden time for you. Open your hearts and recite the mantra and you will be successful in life. Just as the trunk supports a tree, the Gayatri supports the human system and without it, the Tree of Life would be sapless. 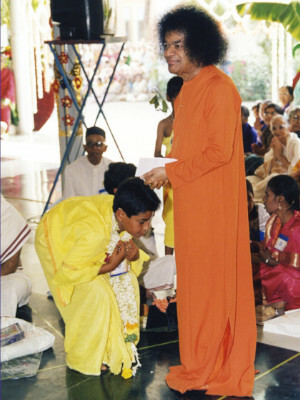 If you chant the Gayatri and also respect your parents as God, then the effects of both these will work together, fuse into one and produce a great effect on your splendour and brilliance", says Baba.